The gallbladder function is important especially from the point of view of digestion. Most of us feel uncomfortably bloated after a heavy meal that is rich in fats and oils. The reason has a link to the proper function of gallbladder. It is because fats take longer digestive period in comparison with that of proteins and carbohydrates. The breakdown of fat globules in food into simpler particles is essential. It is for the end that the regular digestive enzymes may act upon them effectively. This process of breaking down complex fatty substances into simpler molecules is emulsification. This is exactly the function of bile juice that the hepatic cells in the liver secrete. Afterwards the hepatic juice enters gallbladder for temporary storage. Here follows a brief description of the gallbladder function. Just read it carefully and have an idea about the role of this tiny organ of the body. The major gallbladder function is to act as a store house for bile juice. The bile juice remains here until need arises in the intestine for the digestion of lipids. The liver is the organ that secretes the bile. Here is an interesting fact about the liver that it is the hottest organ in your body. At the same time, the liver is also one of the most important body organs. Also known as “gall”, bile is a dark green or yellowish brown fluid that contains up to 97% water. However, the remaining 3% of its composition comes from other substances, including bile salts, inorganic salts, bilirubin and fats. Here it is necessary to realize that there are no enzymes in the bile juice. It is an important and interesting gallbladder function that the gall or bile behaves like an anti-oxidant. Therefore, the gall can remove toxins from the blood and ingested food. Oxidation reactions taking place in the body produce free radicals which are harmful for health. On the other hand, playing the role of an anti-oxidant, bile juice counters the poisonous effects of these substances. Another important thing, worth mentioning here, is that the removal of these free radicals also serves to delay the process of aging. So, you look young when actually you are not! As bile fluid is alkaline in nature, it also helps to neutralize hydrochloric acid in stomach during times of starvation. Hydrochloric acid or HCL, in the stomach, has the pH value of 2. This strong acidic concentration helps in the digestion of proteins present in the food. First of all, the inactive pepsinogen converts into active pepsin enzyme in this acidic medium. The digestion of fats, on the other hand, requires an alkaline medium. So, bile comes to play its role here. It quickly turns the acidic medium into alkaline one as food enters the small intestine after partial digestion in the stomach. Another significant gallbladder function is that of the emulsification of lipids. 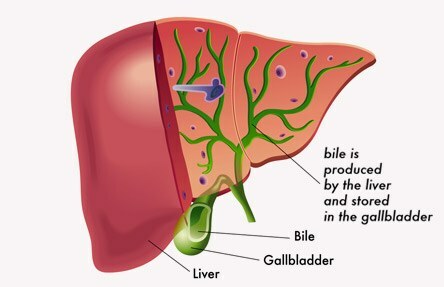 The bile juice, coming from gallbladder, also has a potential to emulsify lipids or fatty substances in diet. After that, it becomes easier for the enzymes to undergo the digestion of emulsified fats. As an emulsifier of fats, bile aids a great deal in the process of food digestion. Bile is also important from the point of view of absorption of food. This fluid assists in the uptake of fats and fat-soluble molecules across the wall of small intestine into the body. After entering the blood stream, these small food particles travel through blood vessels. Finally, these food particles reach every individual cell. The powerhouses of the cells, mitochondria, carry out further breakdown of these particles. This breakdown occurs through the process of respiration to extract energy present in the bonds of compounds. The elimination of waste products is another gallbladder function. 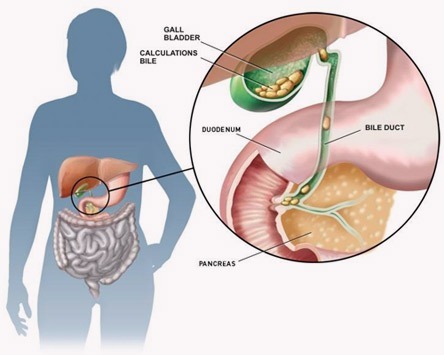 In other words, gallbladder play an important role in the elimination of waste products from the body. The waste substances, including bilirubin, are secreted into the bile. Actually, after the recycling of red blood cells by the liver, bilirubin produces as a byproduct. This gall then empties into the small intestine. From there, it travels along with other waste products in the intestine towards the posterior end of the gastrointestinal canal. Finally, it discharges out of the body along with feces. What Affects the Gallbladder Function? Cholecystitis: It is one of the most common diseases of gallbladder. The condition of cholecystitis refers to the inflammation of the biliary vesicle. There can be different background factors for the onset of this disease, such as gallstones. The gallstones cause an obstruction in the bile duct which carries gall and empties it into the small intestine. The accumulation of hepatic juice leads to high swelling in the organ. Cholecystitis involves the symptoms of fever, nausea, vomiting, and pain in the abdominal area. Gallbladder Cancer: As the very name indicates, gallbladder cancer is the development of malignant cells in the organ. Here it is important to note that the malignancy of biliary vesicle is usually very rare. Meanwhile, the diagnosis of the condition is also very difficult. It is because the symptoms of cancer and other diseases are usually very similar and include fever, jaundice, nausea and vomiting. It is surprising to note that people can survive and lead a normal healthy life even without gallbladder. Nevertheless, this biliary vesicle has got certain very important roles to play in your body. 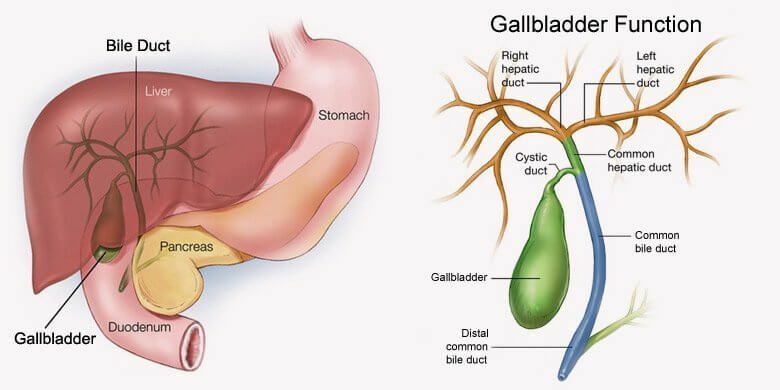 The gallbladder function includes serving as a storehouse for bile and role as anti-oxidant. Meanwhile, the emulsification of lipids, contribution in digestion, facilitation of absorption and elimination of waste products is also the function of gallbladder.